We are located at 230 E. Elkhorn Avenue (Main Street) in downtown Estes Park, across from City Hall and just down from the Dairy Queen. Park in the parking lot located by the Dairy Queen and its a short walk East to our Shop. 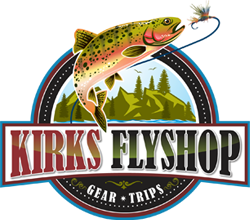 Kirk's Flyshop is Estes Park's Premier Flyshop! We offer the most exciting and memorable fly fishing trips in Rocky Mountain National Park, Estes Park Valley, and The Big Thompson River! We are also able to take our clients to other locations including 5 miles of exclusive private river on the Big Thompson and St. Vrain Rivers. We also have access to over 10 different lakes with trophy sized trout! Our Estes Park fly fishing adventure trips include floating down the Colorado River, backpacking into the remote wilderness of Rocky Mountain National Park, horseback riding up to high mountain streams, or trekking with llamas to pristine mountain lakes. Kirk's Flyshop will take you to any of these locations and ensure that you have a trip of a lifetime! 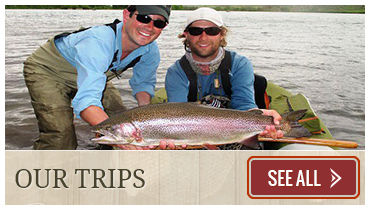 Our fly fishing trips accommodate beginners, advanced anglers, families, and anglers with special needs. Want to know the best part about Kirk's Flyshop? Each trip comes with a fish-catch guarantee! This is no extra cost to you. Also, very piece of gear is provided in the cost of the overall trip: rod, reel, waders, and flies! So stop waiting! 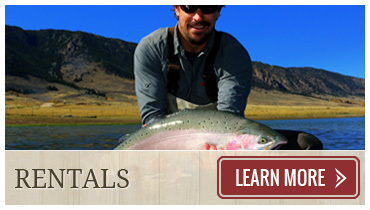 Schedule your fly fishing trip in Colorado today! WANT TO PLAN A HIKING TRIP? Kirk's Mountain Adventures is located in beautiful Estes Park, Colorado, the Gateway to Rocky Mountain National Park. We are a family owned and operated mountain adventure company, offering the highest quality backpacking and camping gear, as well as adventures into Rocky Mountain National Park! Book today your guided day hike, snow shoe trip, Longs Peak trip, llama day trek, or overnight backpacking, llama pack or horseback trip! Call (877) 669-1859 to reserve, or click on the logo left to begin your adventure!